The duck vehicle in last week's fatal crash has been raised, its two young victims recovered and mourned. Now the legal battle begins. A lawyer for the victims' families said Friday that the operators of both the duck and the tugboat that struck it July 7 are guilty of negligence, and that his clients were preparing to sue. Ride the Ducks officials "should have operated a well-maintained craft if they're navigating in the channel," said lawyer Robert Mongeluzzi. He also faulted K-Sea Transportation, operator of the tugboat driving the 250-foot barge, for failing to steer clear of the 31-foot Duck 34. Representatives of both companies declined to comment on Mongeluzzi's accusations, saying the National Transportation Safety Board was still investigating. A spokesman for the NTSB said Friday that its on-site investigation would likely conclude this weekend, but that a final report could be 18 months away. Interim reports, including initial findings and transcripts of interviews, could be released sooner, said Keith Holloway. The amphibious Duck 34 had anchored in the shipping channel of the Delaware River after its engine failed, and was struck about 15 minutes later. 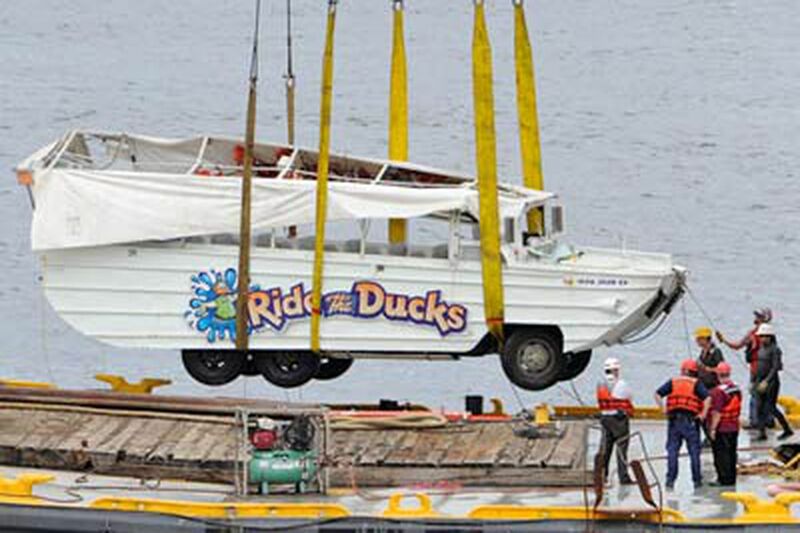 That crash sent the duck's 35 passengers and two crew members into the water. Hungarian tourists Dora Schwendtner, 16, and Szabolcs Prem, 20, drowned. Each was an only child. "The families are just devastated," Mongeluzzi said minutes before leaving his Center City law office for a flight to Hungary to meet with the parents. Mongeluzzi is a prominent litigation lawyer whose clients have included the families of victims in the Pier 34 nightclub collapse of 2000, in which three people died and dozens were plunged into the Delaware. The case was settled for $30 million. He said he would serve as co-counsel with the New York firm of Ronai & Ronai, also hired by the Schwendtner and Prem families. Prem was evidently caught in or under the 31-foot vessel after it sank near Penn's Landing. Schwendtner's body was found about two miles south, apparently carried by the strong current. Neither was wearing a life jacket; some other passengers donned theirs moments before the crash. That the duck's engine and signal horn both failed that afternoon suggests maintenance was not adequate, said Mongeluzzi, adding, "We'll also be looking at the issue of design. Vessels, when capsized, should not immediately plunge to the bottom of the river." There are also questions as to whether the duck captain made timely or audible warning calls by marine radio to other vessels in the channel. Mongeluzzi was equally critical of the tug company. "They were operating a 250-foot barge with a giant blind spot," he said. The tug Caribbean Sea was secured with hawsers to the left rear corner of the City of Philadelphia's sludge barge Resource. Although the tug's steering station sits atop a tower, tug operators say it is difficult to see what lies on the barge's far sides when the barge is empty and riding high. "They needed to see ahead, and they didn't," said Mongeluzzi. He said the failure of the tug's pilot to post a lookout under the circumstances, and his refusal to cooperate with the NTSB investigation - he invoked the Fifth Amendment - suggested culpability. "Either he didn't see it, or he saw it and failed to recognize it was dead in the water," Mongeluzzi said. "But you can't go blindly up a channel and say, 'I've got the right of way.' When another vessel's in distress, you have to navigate." The Caribbean Sea had a standard crew of two officers, who are licensed by the Coast Guard, and three deckhands when it hit Duck 34. Its first mate, who is second in command after the captain, was steering and alone in the wheelhouse, according to the NTSB. The first mate's name has not been made public. "When the key person pleads the Fifth and won't talk, it robs parents of the ability to find out what happened and have closure," Mongeluzzi said. Lawyer Frank DeSimone, who represents the first mate, took issue Friday with Mongeluzzi's assertion that the pilot was probably at fault because he invoked the Fifth Amendment. Since federal statute defines manslaughter as "unlawful killing without malice" and simple negligence as injury caused by a failure to exercise "due caution or circumspection," he said, he advised his client not to talk to the NTSB. "Anything he said could be used by a lawyer like Mongeluzzi" or by prosecutors, DeSimone said. "That was my dilemma." DeSimone represented Pier 34 operator Eli Karetny, who pleaded guilty to three counts of involuntary manslaughter and one count of recklessly endangering another person. Karetny was sentenced to house arrest and 1,000 hours of community service. Doug Oliver, a spokesman for Mayor Nutter, said Friday that K-Sea resumed sludge transport on the Delaware on Thursday. K-Sea, a major tugboat operator, has a contract with the city to deliver sewer sludge from the Northeast to the city's treatment facility on the Schuylkill. The city suspended deliveries last week to review safety procedures. Oliver said Resource has not yet been returned to service.